Whilst the majority of flying drones have so far been based on a quadcopter design with four rotating blades, there are safety issues with these coming into close contact with humans, as well as a lack of efficiency and agility which limits their use in rescue operations. Researchers are therefore looking for more efficient flying drones and to that end, the National Science Foundation in the US gave researchers $2.2 million to come up with a new design. A team, led by Soon-Jo Chung of the California Institute of Technology, set about designing a more effective drone, and turned to the natural world for inspiration. They decided to base their new autonomous drone on our only flying mammal, the bat. Bat-bot is known as a biomimetic robot which aims to closely replicate the movement of the animal that inspired it. The choice to base a flying drone on a bat might seem like a strange one, but in fact the researchers say it makes perfect sense. Unlike the fairly common drone quadcopters, Bat Bot’s soft wings and lack of spinning rotors make it safer choice to use around both humans and other flying robots. The inventors of Bat Bot envisage it flying around new building sites, perching on beams to take photos and potentially spotting any structural flaws or mistakes. If Bat Bot happened to bump into a construction worker then it certainly wouldn’t cause any injuries to the worker, unlike a conventional quadcopter drone. Drones inspired by bats have the potential to be significantly more energy efficient than current robots, but first the team needed to understand more about the kinematics of bat flight, and whether they could recreate this in a drone. The result is Bat Bot: Bat Bot is a self-contained robotic bat with a soft silicone wing membrane stretched over a carbon fiber frame. Weighing in at just 3.3 ounces there’s an awful lot of technology packed into a small space. 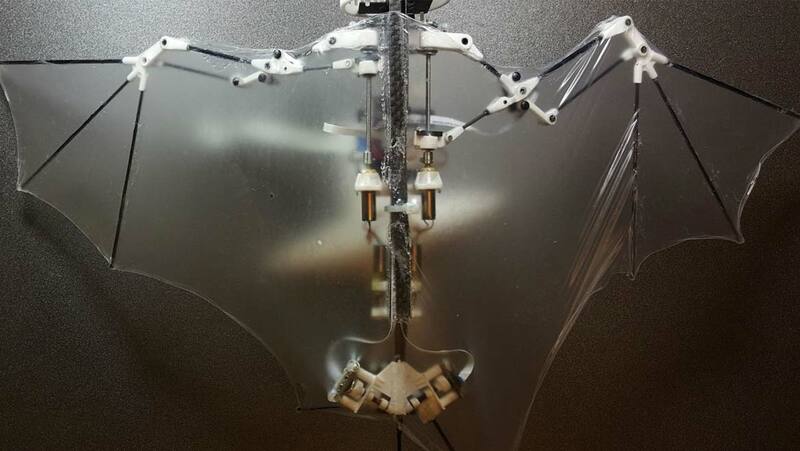 Designing a drone to mimic the anatomy of a bat was certainly a challenge for the team, which included robotics researchers from the University of Illinois Urbana-Champaign and Caltech. Bats have over 40 passive and active joints in their wings, combined with a flexible membrane. It was never going to be possible to incorporate all of these into the design of the robot, because the design would have been fair too heavy to achieve flight. Instead, they closely studied bat flight, and worked with biologists in order to isolate which joints were absolutely vital to successful flight and which ones they could safely leave out without compromising the flight ability of the robot. They focused on nine joints which provided the majority of movement they were looking for, and successfully incorporated these into Bat Bot in order to mimic the anatomy of the bat and therefore best match the characteristics of their flight. Bat bots carbon fibre fingers haven’t got any knuckles or knuckle joints, nor does Bat Bot have the ability to twist its wrists like a real bat. The continuous surface and elastic properties of the wing membrane was mimicked through the development of an incredibly thin (56 microns) silicone membrane. The anatomy of the bat wing has been simplified though, as bats wing membranes have different levels of stiffness in different places, whereas Bat Bot’s silicone membrane is uniformly flexible. Five motors, a microprocessor and sensors all work together to allow the Bat Bot to fly autonomously. As well as closely mimicking the bat’s anatomy, the on-board electrics allow the Bat Bot to replicate the swerving and diving aerial manoeuvres of the real thing. Bat Bot is capable of flying completely autonomously, executing glides, long banking turns and sharp dives with ease. If you’re not a keen-eyed biologist then it’s pretty difficult to distinguish from the real thing. It also requires much less battery power than a rotor based helicopter or quadcopter design, an advantage if it’s being used in remote areas. Despite this, the team who developed Bat Bot are now looking at improving their original design to add a few extra capabilities. Currently, Bat Bot can’t ascend in the air, only flap through an extended glide. It also can’t assume that classic bat positon of hanging upside down. But who knows, you might see this little robot swooping through the skies very soon.